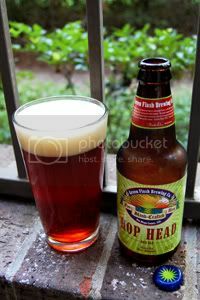 The first Green Flash brew I sampled here on PintLog was their flagship West Coast IPA, which I absolutely loved, so I was excited to pick up their American Red Ale, Hop Head Red. These guys are known for their typically west-coast hoppy beers, so there's no doubt this is going to be a hoppy red. In fact, Green Flash themselves imply this might be more of a red/IPA hybrid. The brewery only reveals that it's dry hopped with Amarillos, but others online have speculated that Chinooks are used for bittering. They describe the beer thusly: "Resinous hop character and bitterness balance the rich caramel malt base." You guys ready for a red-head? Appearance: A deep orange-brown body with a hell of a lot of sediment in solution. Up top, a finger and a half of pillowy, caramel-tinged head that features great retention and lacing. Aroma: Just as the bottle leads you to expect: lots of Amarillo hops on top of a solid caramel base. Good stuff. Taste: More of the same. Up front, citrusy, nicely bitter hops. Underneath, the caramel malt backbone is strong enough to keep everything from being unbalanced. The aftertaste is of bitter grapefruit. Mouthfeel: Perhaps a little fuller than medium and smooth with moderate carbonation. Dry finish. Drinkability: As long as you aren't afraid of hops, this is pretty sessionable brew. Verdict: Well, the bottle really says it all, this is a generously Amarillo hopped Red Ale with a lots of caramel malt. It may blur the line between Red Ale and Pale Ale a bit, but who cares?